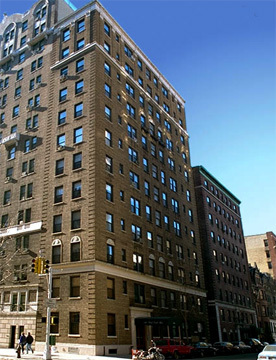 This pleasant, narrow, light-brown brick apartment building at 599 West End Avenue on the southwest corner at 89th Street was erected in 1924 for the West End Avenue Corporation of which David Greenberg was president and converted to a cooperative in 1984. The 12-story building has 28 apartments and brick quoins. The entrance on the sidestreet has a canopy and a limestone surround. The facade has two bandcourses. It has protruding air-conditioners and inconsistent fenestration. It has no sidewalk landscaping, no garage, no health club and no garage. It is one block to the east from Riverside Park and one block to the west of convenient neighborhood shopping on Broadway. It is also very convenient to excellent crosstown bus service on 86th Street and not far from a local subway station at 86th Street and Broadway. This area has undergone significant upgrading in the 1980's and 1990's and is now one of the most desirable on the Upper West Side. The site was formerly occupied by a four-story rowhouse.